Mexico City.- President Felipe Calderón declared that the financial crisis will not deter his administration from its goal of alleviating and eradicating extreme poverty, nor will it abandon them, since this is an effort to achieve solidarity and justice. “We must make every effort to ensure that Mexicans who managed to improve their levels of well-being and reduce their poverty levels do not return to the extreme poverty in which they used to live,” he declares. During the presentation of the Global Report on Human Development 2009, the President declared that during the current economic situation, government will not use the crisis as an excuse to abandon the poorest sectors of Mexico to their fate. He therefore asked Mexicans to make an effort to increase social expenditure targeting this problem which affects over 19 million persons. “That is why the economic proposal I have submitted to Congress will respond to Mexico’s current situation: the drop in income, meaning that we will seek more income and attempt to drastically reduce government spending,” he said. In the presence of Magdy Martínez-Solimán, Resident Representative of the United Nations Development Program in Mexico, the Mexican President hailed the fact that this report favors Mexico, since its evaluation has improved since 2007. “This means that the public policies oriented towards human development are the right ones and have functioned in stable conditions. This means that the path we have followed in social policy, under equal conditions, ceteris paribus, as the scientists say, is the right social policy,” he said. This is the case of the Oportunidades Program, which has proved to be a powerful tool for improving the food, health and education of the families it targets. It has been reproduced in several countries, under different names, to achieve this purpose. “And it is a program that is a long way from being either paternalistic or welfare-based. The point is not to give away money, particularly not in exchange for electoral support, but rather to support income, accompanied by the responsibility of the beneficiary family to take its children to school and the doctor, and to attend courses on nutrition and improving family life,” he explained. 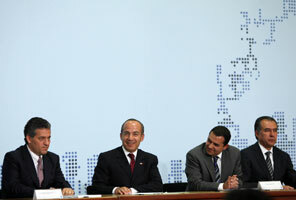 During the presentation of the 2009 Report, called “Overcoming Barriers: Human Mobility and Development,” President Calderón referred to the issue of migration, adding that no migratory policy is above people’s rights, and repeating the federal position on behalf of legal, orderly, safe migration that respects human dignity. He said that migrants do not take people’s jobs away nor do they affect workers’ salaries in the countries they emigrate to and on the contrary, they boost both economies. “Incidentally, Latin American and Mexican migration in particular have been crucial to the economic development of the United States during the second half of the last century,” he declared. Lastly, he remarked that the aim is to continue to improve the country’s Human Development Index to cope with the crisis of public finances and above all, the risk of an increase in poverty. That is why, he said, despite the crisis, Mexico will continue to be committed to the Millennium Goals. “Despite adversity, we will continue to progress. We will continue to be committed to the struggle on behalf of those with least and I know that in this effort to alleviate poverty, Mexican society as a whole will be able to provide what our beloved Mexico requires,” he declared.